Sealing stone pavers is an optional process but can be a good preventive measure in keeping your stonework clean and fresh-looking for a longer time. 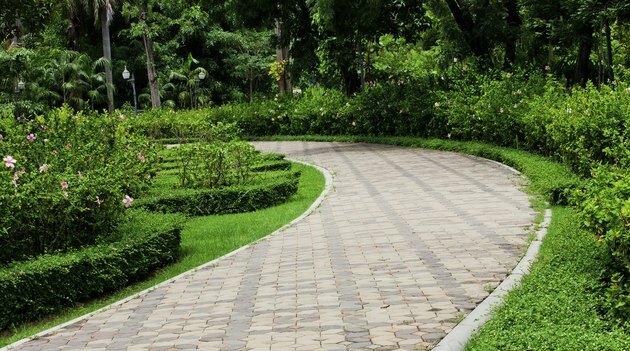 Pavers subjected to oil and grease staining -- such as those used in driveway applications -- are much easier to clean if they've been sealant-protected. Sealing agents may be applied to concrete, slate, clay, granite, natural stone, stamped concrete and block pavers. Sealing a driveway is a good preventive measure against vehicle leakage. Sealing leaves a clear gloss finish that brings out the colors in your pavers, giving them a clean, wet look. Sealant promotes durability and provides greater longevity to your paving stone. The coating repels moisture, thereby reducing water damage and the loss of sand dust in the joints. Paver loosening and cracking is reduced, as is weed and grass growth between the stones. Sealed stone is better able to withstand harsh weather conditions and reduces the harmful effects of snow and ice. Some pavers come presealed, negating the need for protectant after installation. You may choose to prepare your pavers by dipping them in sealant prior to laying. Post-installation methods include applying sealant with a paint roller attached to an extension device; brushing or sweeping in sealer with a brush or broom; or spraying on the sealant using a hand-held bottle or spray pump. All methods can be either do-it-yourself activities or left to installation professionals. There are two main sealant formulations. Film formers protect pavers by blocking the harmful effects of water and other contaminants. This sealant type creates a barrier on the stone surface and provides a fresh-looking sheen to the stone, accentuating its colors. Penetrants, used for the more absorbent types of stone, sink into the surface to seal and protect it from the elements. Film-forming sealants may require repeated applications as your pavers age. Surface sealants can break down over time, especially if incorrectly applied to porous stone. All sealants require the applier to wear suitable safety equipment such as a mask, gloves and shoe covers. Application requires a calm day to avoid overspray contamination to adjacent lawns and shrubs. If you prefer a natural look, and staining isn't a major concern, stone pavers need not be sealed at all.